WOG 3.58f, which has this ridicilous request of having everything USA english. Not so ridiculous, considering that you weren't born when they made it. Old mods require old tricks. Edited by phe at 20:42, 13 Aug 2018. Edited by Warmonger at 20:57, 13 Aug 2018. THIS is exactly why ERA exists in first place, just to get rid of such ridiculous and outdated workarounds. 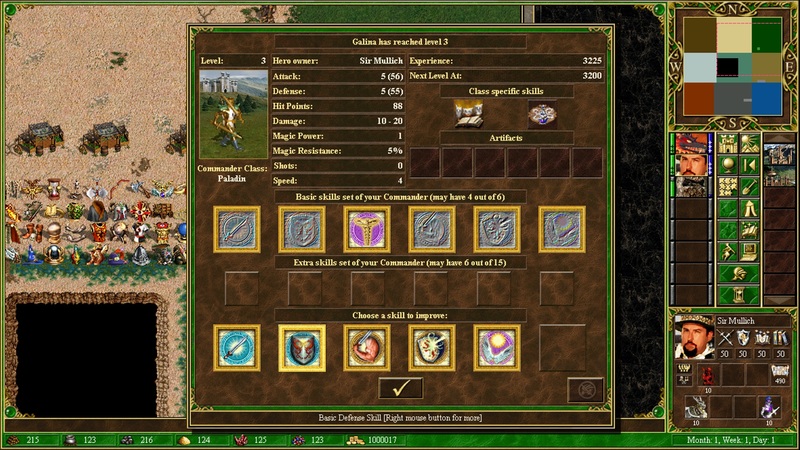 Wog 3.58f was released in 2004, it still amuses me people keep finding it at the end of Internet. Wasn't WoG made in 2001? I was myself born on 1998. Also, it works with the HD Mod but the unit movements in the battle are a little odd, the frame rate is odd, by the way it recently crashed in the beginning of the battle for no reason, so I'm more than eager to do something about it. Someone in the HC messenger sent me the link to that version and I just downloaded it. So I guess problem maybe has source with messing WoG and Era files in one folder. ERA II should be install at clean H3 copy. As if completely clean? No HotA nor HD Mod? H3 complete or SoD, then Era 2, then HD mod. Hota not compatible, should be installed separately. No, better try install at clean H3. [-] Fixed WoG bug: ! ?BA0 and ! ?OB54 could return level 1 (underground) for ground from time to time. Many scripts used to crash because of it. [-] Fixed WoG bug: double ! ?OB54 event generation when attacking without moving due to Enter2Object + Enter2Monster2 calling. posted September 10, 2018 08:10 PM bonus applied by Maurice on 22 Sep 2018. [-] Fixed WoG bug, causing many crashes (invalid underground detection), when HD mod was enabled. MixedPos function will now drop higher order bits and not treat them as underground flag. Edited by RerryR at 23:27, 11 Sep 2018. Thanks for the new Version Bersy! from 1 to 0 and it is muuuuuuuuuuch better now! Real difference. So I don't know if it will cause problems in future but just for everybody having the same problem, this might be a solution. Thanks ) Please, set UseOnlyOneCpuCore to 1 to prevent sudden crashes, related to concurrent threads generating different ERM events at the same time. I tried to reinstall ERA over the same game folder. The error remained. I removed the whole Mods folder and reinstall ERA. The error was gone. But some ERM error (which never appeared before in 2.46) appeared at the start of a map. After I put back all my mods, the angel.dll error appeared again. Then I reinstall era 2.46 over 2.77. The angel.dll error remained. I have another copy of ERA 2.46 in a separate folder. And that works fine. And I find 2.77 does not have a list.txt in mods folder. Please, install 2.7.7 over SoD/Complete and check if Mods/modslist.txt is ok. If there is no ModsWoG directory (this may happen due to some really strange bat-file behavior), simply run the installer again. Edited by Forsberg at 15:07, 16 Sep 2018. Hey, how to get bigger ERA window menu? It is very tiny compared to the rest of the game where everything is properly scaled. Edited by igrik at 14:42, 19 Sep 2018. 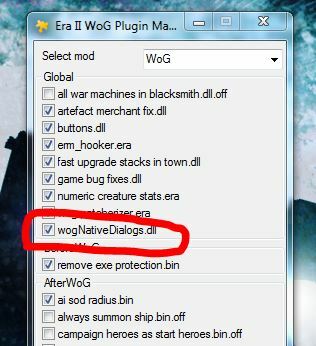 You need to enable "wogNativeDialogs.dll"
Where is that app? I have only "Era Start Menu"?